Thank you to everyone who supported the Charlie Cookson Foundation by taking part in the competition to win Mambo Wine and Dine vouchers. Some of the answers to how many pairs of shoes I own made me laugh. I’m not sure where I would manage to keep 163 pairs of shoes which was the highest answer. And I can hardly believe my own sister thought I would only have 40 pairs – I sometimes wonder if she knows me at all. To be honest I didn’t even know how many pairs I had. 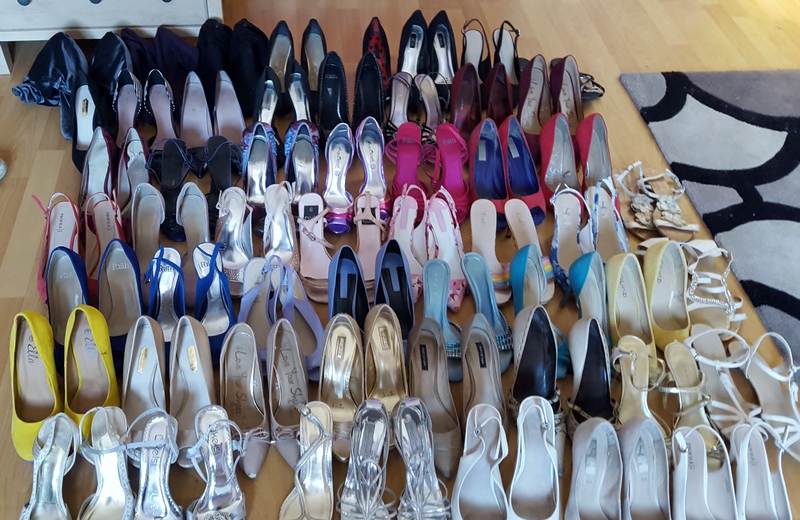 I knew that in April after a big clean out I had 66 pairs but I knew I’d thrown some away since then but I’ve also bought a couple of pairs so I had to count them. So I emptied all the shoe racks in my wardrobe, hunted through the house to make sure I hadn’t missed any and even found one pair in the back garden (I wear them when I’m cutting the grass) and laid them all out in pairs on the living room floor. I took some photos to post here. Then I counted them. And counted them again. And because I was still in shock I counted them for a third time. But the answer was always the same. I only have 54 pairs of shoes. I was sure that couldn’t be right, I was sure I must have had getting on for 100 pairs by now but no just 54 all of which are in the photo below. So now I just needed a winner. I looked at all the guesses and apart from my sister’s guess of 40 every single guess was more than I have but there was one that was quite close.